Just because the days are getting shorter doesn’t mean you can’t bring a little light into your life with our bright Vera Bradley colors and patterns! Find the perfect accessories to match your winter fashion this year, or search our collection for the perfect holiday gift! 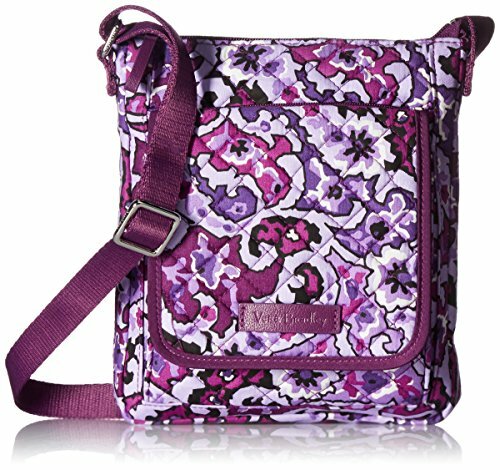 Our genuine Vera Bradley Mini Hipster will warm up your sense of style this season with the fun and considerate designs we are known for. Featuring the ultimate in hands-free organization, our clever Mini Hipster Crossbody measures 6 x 7.5 x .75 inches with a 56 inch adjustable strap. This fun little hipster features credit card protection with RFID technology, one zippered exterior pocket, two exterior slip pockets, and main compartment with zip closure perfect for phones and small notepad with convenient two-way-wear, either hung from your shoulder or across your body from shoulder to hip. Made with machine washable Signature Cotton to keep you chic wherever you go. At Vera Bradley, we believe in quality and style which is why we build our beautiful bags to keep you in lasting luxury with our Iconic Collection. Our quilted cotton is colorful, lightweight, packable and (in some cases) washable. The quilted stitching sewn in tight configurations make up the iconic Vera Bradley Square Diamond Stitch, which not only adds an element of embroidered appeal and aesthetic, but also enhances the structural integrity of your favorite bag. Our products are made for long lasting convenience and style, this item can be a go-to staple for years to come. At our very core, Vera Bradley is an innovative brand for women. We’ve always been inspired by the needs of real women, and our proudest moments have been when we can bring communities of women together through their shared love of beauty. We design our products with a deep understanding of our consumer. You are the focus of all we do.